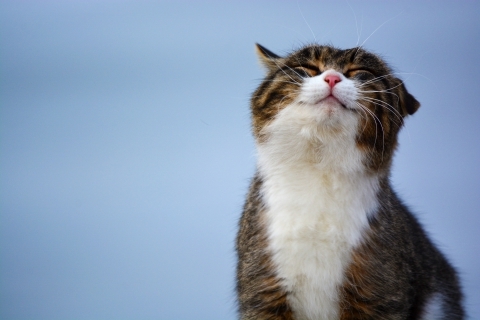 Animal Care in Tulsa - So Your Cat is Scratching Everything? So Your Cat is Scratching Everything? Cats are incredible companions that can lift your spirits when you have a bad day, make you laugh with their wide and curious eyes, and be a great snuggle partner when you curl up with a good book. But as any cat owner knows, they do also have an innate, mischievous behavior. It’s one of the reasons we love them! What no one loves, however, is when they get into a habit of scratching on your furniture or other valuable materials and things. Cats love scratching. It lets them mark their territory, it feels good removing the dead layer of their claws, and obviously, as so many dogs know, they need their claws for defensive purposes. When you get a cat, you know they’re going to scratch. It’s on you to prepare. But sometimes no matter what, you find the legs of your dining table scratched up, your couch in tatters, and clothes ripped to shreds. You will understandably be upset. Here at Southern Hills Veterinary Hospital in Tulsa, we want to help you put an end to this annoying habit of your favorite little furball! 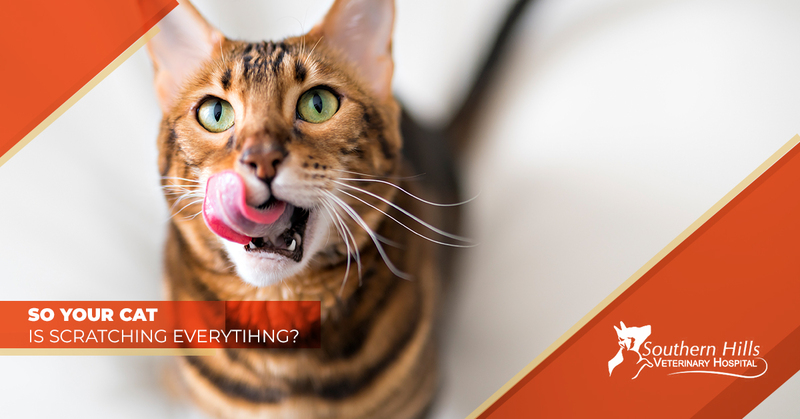 Our staff knows a thing or two about animal care, so if you’ve found that your cat just can’t stop scratching away at things inside of your home, we want to offer you a few things that you can do before you submit and let the cat reign supreme over your own home. Before we get started, however, we would like to say that declawing your cat is never the answer. This irreversible procedure is incredibly painful and can lead to many complications later on. And you love your cat! So, of course, you wouldn’t hurt them! If you would like any more suggestions or if you need to bring your cat in for any of our veterinary services, then please contact our animal hospital today to book an appointment! 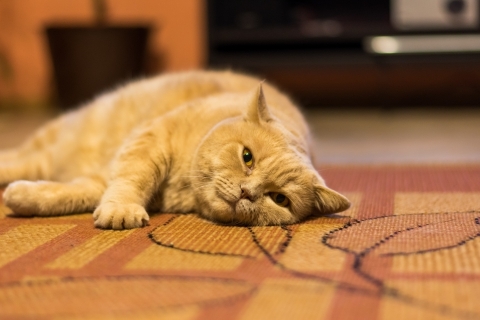 The most obvious solution to help curb your cat’s love of scratching anything and everything in your home is to give them a spot that they can do it without making you pull your hair out! If you haven’t yet, investing in a cat post is a must! In fact, sometimes one cat post won’t do. Don’t worry, they are very affordable and come in all shapes and sizes, and your cat will love scratching the post(s). If you didn’t have a post before getting your cat and they’ve found some favorite places to scratch, we recommend setting the post in those areas. That way, they’ll already be accustomed to scratching in the area, it will just be a post they’re scratching instead of your couch! If there is one thing that cats don’t like (well, aside from dogs and the bathtub) it is sticky surfaces. They hate the feeling, and it ruins what they thought was going to be a good time. Therefore, another great tip to prevent your cat from scratching is by putting double-sided tape on some of the areas that have become their favorite. There are actually products out there specifically for this reason, but normal double sided tape will do the trick too. Don’t worry, your house doesn’t have to have this tape everywhere in the house permanently. After a few times of that icky, sticky feeling, they’re going to avoid scratching in that area again. While declawing is a definite no, there is a safe way to trim your cat’s nails without hurting them and preventing damage to the things around your home. The trick is to be very careful when trimming the nail and not to cut too high up, this will lead to pain, bleeding, and likely a not very happy kitty. To be safe, if you need to have your cat’s nails trimmed, just contact our veterinary clinic and we’ll take care of it for you! We’re experts in animal care and you can rest assured that your furry friend is in good and gentle hands! Along with scratching posts, there are many herbal sprays on the market that will prevent scratching. They hate the stuff and avoid it as much as possible! However, with so many options, some are not incredibly safe for your cat. If you would like to try out a spray but are unsure what the best and safest product would be, simply ask your veterinarian at Southern Hills Veterinary Hospital here in Tulsa! They will be able to point you in the right direction with some recommendations on what former clients have found to work. If your cat doesn’t stop scratching after day one, or even a couple weeks, of trying these methods — don’t fret. Sometimes these things take time. As we all know, cats are smart, as well as they get attached to certain things or areas. They might not be ready to say goodbye to their favorite scratching area immediately, but soon enough, they’ll let it go. Another thing to remember is not to punish your cat. Spray bottles are fine (don’t over do it) but don’t forget that scratching is just in your cat’s nature. They do it because it’s — well, it’s what cats do! So cut them a little bit of a break for some scratching. However, if your cat has become aggressive and is excessively tearing apart the things in your home, this might be a cry for help. Sudden changes in behavior and aggression are often signs that they are struggling or incredibly unhappy about something, and it could possibly be an illness or some other condition that is causing them pain. So it’d be important to get them in and let us take a look. We hope that these animal care tips will help and that your furniture and belongings are safe after you give them a shot. If you would like any more information or need to make an appointment at our animal clinic, contact us today to make an appointment! Should You Get Your Pet Microchipped? ©2018 Southern Hills Veterinary Hospital. All rights reserved.